Our terminal operations help Customers get the benefits of rail freight without onsite rail access at their facilities. We currently operate more than 40 transload facilities throughout North America, owned by Savage, Customers, or Third Parties. We handle a range of petroleum products, chemicals, and petrochemicals, resins, fuels, food-grade products, dry bulk, industrial and construction materials, and other industrial commodities—safely and efficiently. Our terminal operations provide specialized solutions for moving materials on land or water, by rail, truck, barge, or pipeline depending on the location. We are a leading company for crude-by-rail and offloading of crude oil at refineries. 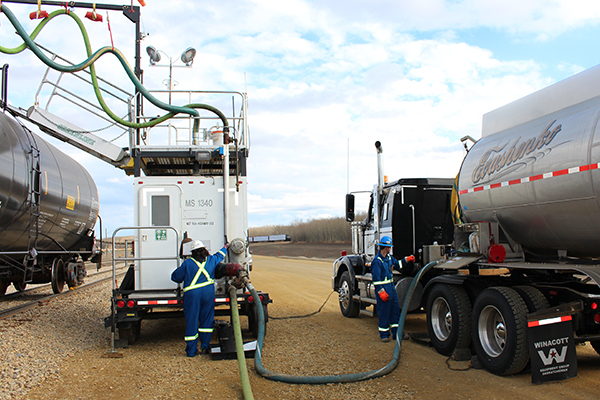 We can design, build, and operate customized equipment and systems, including mobile transfer racks, fixed loading and unloading facilities, and storage tanks. One example of a Savage-owned and operated terminal is the Savage Bakken Petroleum Services Hub in Trenton, North Dakota. This 50-acre facility has 250 railcar spots with crude oil unit train loading facilities, a manifest transload area, five storage tanks, BNSF main line access, a pipe storage yard and state-of-the-art facility for pipe threading and inspections, and access to the Savage Bakken Connector pipeline that connects to the Dakota Access Pipeline. In addition to our own terminals, we operate Customer- and third-party-owned terminals in the United States and Canada, providing multi-commodity transload services for a wide variety of dry bulk and liquid bulk products including hazardous and non-hazardous materials, petroleum products, food-grade, chemicals, and petrochemicals. View our transload terminals map and fact sheet for more information.